The Library of Congress Center for Architecture Design and Engineering hosted a standing-room-only, six-speaker symposium on Nov. 14 in celebration of the 75th anniversary of the Historic American Building Survey (HABS), the only continuing New Deal program and one of the Library's most popular and beloved collections. The symposium, "American Place: The Historic American Buildings Survey at 75," surveyed the success of the program that had its genesis in the Great Depression. In times of great economic hardship, the arts are often the first expenditure to be cut as funding drops away and priorities are triaged. So it was in the Great Depression of the 1930s. Photographers and writers found themselves out of work as commissions dried up and publications folded. Architects, practitioners of the most expensive and involved of arts, had nothing to do and no way to live as buildings ceased to be built. The Historic American Buildings Survey was created in 1933 under President Franklin D. Roosevelt's New Deal to provide much-needed work for architects, photographers, and historians, who documented America's built environment at a key moment in modernization and nationalization. The effort provided an invaluable historical record of sociological, technological, and design development as well as art, information and inspiration for Americans of that time and ours. HABS was the first significant boon to historic preservation at the national level. The program field-tested many of the preservation strategies still in use today, such as surveying contextual information and the establishment of national standards for documentation. Still growing after 75 years, HABS and its affiliated engineering and landscape surveys record more than 500,000 drawings, photographs and histories for more than 41,000 historic structures and sites dating from Pre-Columbian times to the 21st century. HABS continues to thrive in a tri-lateral partnership consisting of the Library of Congress, the National Park Service and the private-sector American Institute of Architects. The AIA guides architects and architectural professors and students who volunteer as survey teams, which, under the Park Service, now document buildings from high-profile, high-style homes of presidents and soaring houses of worship to everyday dinettes, infamous slave markets, humbly dignified tenant-farm shacks and other 'forgotten' building types that help tell America's story but whose memories might be lost if not for HABS. Surveys are often recorded in the nick of time as structures crumble, fortunes and fashions change or cities re-zone, refresh and move on. 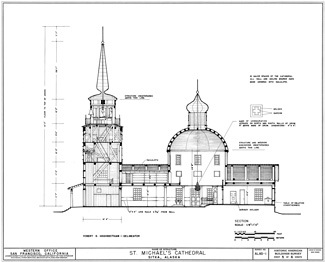 A detailed drawing from the Historic American Buildings Survey (HABS) enabled the St. Michael's Russian Orthodox Cathedral in Sitka, Alaska, to be rebuilt and dedicated in 1976, following a fire in 1966. The church was originally built in the 1840s. Historic American Buildings Survey is housed, researched and served by the Library's Prints and Photographs Division. The survey is one of the Library's most heavily used collections, which may be accessed through Library visits, the hugely trafficked HABS site on the Prints and Photographs Online Catalog, and publications such as the Library's Visual Sourcebooks series. Users include elementary school geography students, family genealogists, and contemporary architects. Hollywood producers use HABS to define and convey a sense of period authenticity and visual character. Restoration architects use HABS' precisely measured drawings and evocative, detailed photographs to save endangered national treasures. For example, after a 1966 fire destroyed an elaborate onion-domed Russian Orthodox Cathedral of St. Michael, which was built in 1848 in Sitka, Alaska, the building was wholly and exactly reconstructed from the Library's HABS survey. History lovers, design scholars and accomplished or aspiring architects, who gathered in the Mumford Room for the Nov. 14 symposium, were treated to six speakers representing varying perspectives on HABS' past and future, culminating in a lively discussion of that future. After guests saw thousands of rich illustrations, they visited the Prints and Photographs Reading Room to see some of the actual HABS artifacts. The Historic American Buildings Survey, Historic American Engineering Record, and Historic American Landscapes Survey are copyright-free, contain useful data and beautiful art, are added to quarterly, and are accessible online at www.loc.gov/rr/print and in the Prints & Photographs Division Reading Room. Elizabeth Terry Rose is Curatorial Assistant for Architecture, Design and Engineering in the Library of Congress Prints & Photographs Division. Originally published in Library of Congress Gazette, Volume 20, No. 2, January 16, 2009, Editor in Chief Gail Fineberg.